In other words, higher total savings. Get the best-in-class total cost of ownership3 and fastest speeds2, plus world’s most secure4 printing and best-in-class energy efficiency1, with the HP PageWide printers. Get value you can depend on. HP PageWide delivers the lowest cost of ownership3 in its class. Saving energy is better for the planet and your business’ bottom line. Get the fastest speeds2 and deepest, embedded security4 for the best-in-class total cost of ownership3 with less energy use1. Boost office productivity and simplify tasks with seamless workflow features. For teams of 5–15 people printing up to 7,500 pages/month. Prints up to 70 pages per minute5. Ultimate value for today’s enterprise—the fastest speeds2 and deepest security4 for the lowest total cost of ownership in its class3. Count on unparalleled multi-level security fleet management features4. Designed for teams of 5–15 people printing up to 7,500 pages/month. Get the lowest total cost of ownership3 and fastest speeds2 in its class; drive productivity with professional-quality colour documents plus superior security4 and proven energy efficiency1. For teams of 5–15 people printing; prints up to 6,000 pages/month. Ethernet and wireless networking options. Get the lowest total cost of ownership3 and fastest speeds2 in its class. Get professional-quality colour documents, fast two-sided scanning, plus best-in-class security features4 and energy efficiency1. Learn how HP’s business printers lead on overall performance in lab tests. See how HP PageWide Business Printers delivers faster printing for less. The secret to affordable colour and fastest in-class print speeds² is a print bar that prints across the page in a single pass - now available in HP A3 PageWide Pro MFPs and printers. Print professional-quality colour documents for the lowest total cost of ownership in its class3. Conserve resources and use less energy than laser printers1 with HP PageWide Technology. Get professional-quality colour prints for a great value with results you expect every time. Original HP PageWide cartridges deliver the consistent printing performance, quality, and affordability businesses demand. Professional colour quality, exceptional security and energy efficiency. Discover the power of HP PageWide Technology today, now backed by a 90-day money back guarantee. 1. Purchase between now and 31st January 2019. 2. Register within 21 days of purchase. 3. Return in the original packaging if not completely satisfied within 90 calendar days of purchase date. 1. Energy claim based on all TEC data reported on energystar.gov as of November 2016. Data normalised to determine energy efficiency of in-class A3 colour laser printers with published speeds of 20 to 80 ppm, excluding other HP PageWide products. Subject to device settings. Actual results may vary. 2. 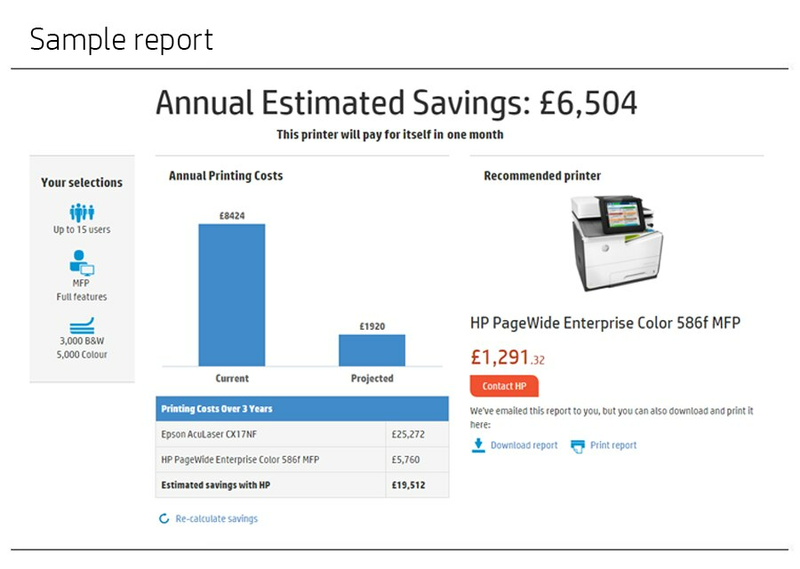 Comparison based on manufacturers’ published specifications of fastest available colour mode of all A3 colour business printers €900-€2,300 Euros and MFPs €2,000-€4,500 Euros as of August 2016, excluding other HP PageWide products, and products with 1% or lower market share using market share as reported by IDC as of Q2 2016. HP PageWide speeds based on General Office mode and exclude first page. Learn more hp.com/go/printerspeeds. 3. Total cost of ownership based on a combination of pages printed, cartridge yields, energy use, and acquisition costs for hardware and supplies. Learn more at hp.com/go/learnaboutsupplies. 4. Based on HP review of 2016 published security features of competitive in-class printers. Only HP offers a combination of security features that can monitor to detect and automatically stop an attack then self-validate software integrity in a reboot. For a list of printers, visit hp.com/go/PrintersThatProtect. For more information: hp.com/go/printersecurityclaims. 5. Measured using ISO/IEC 24734, excludes first set of test documents. For more information, see hp.com/go/printerclaims. Exact speed varies depending on the system configuration, software application, driver, and document complexity.